Today on Caine's Digital Comic Watch, we are happy to present to you an interview with one of the leaders of iPhone Comics Revolution, Emiliano Molina, creator of ComicZeal and ComicZeal Sync! For people not familiar with ComicZeal, how would you describe it? Hi Jim, thanks for the opportunity to talk to you and your readers. ComicZeal is a comic book reader for the iPhone. It allows users to take their digital comics with them and use the iPhone's fantastic interface to read comics in a very natural way. What are some of the advantages of ComicZeal over some of your competitors? ComicZeal is the most mature comic reader on the app store and we treat customer feedback very seriously. For our customers this means that ComicZeal is simply the most feature rich and easy to use comic reader on the App Store. For example, we've spent a lot of time working on the behavior of the zoom and are quite comfortable in saying it's the best available. What makes a difference are little details like a double-tap switching between zoom out and the last zoom that the user selected, or maintaining the zoom level between pages. A lot of users requested customizations for reading manga so we've implemented a feature where CZ detects if you're reading manga or a western-style comic and adjusts accordingly. Recently we added the ability to take a screenshot so you can use an image in a comic as your iPhone wallpaper. A feature that only one customer ever requested, but it was so fantastic we just had to implement it. 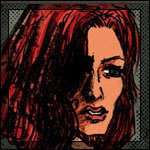 ComicZeal Sync is a companion program to ComicZeal that allows users to move their own digital comics into ComicZeal. The iPhone is such a great device that it's sometimes easy to forget its limits. Early in the development of ComicZeal we experimented with moving full-size unprocessed comics to the device but found that it could just not handle the compression and size of those files without becoming unacceptably slow. ComicZeal Sync processes images, cbr cbz and pdf files and converts them into a format that ComicZeal can easily handle. ComicZeal couldn't be as responsive or pleasant to use without it. Does ComicZeal come with free content? How much? Yes, thanks for asking! There are a couple of hundred comics that can be downloaded from within ComicZeal. One collection that I'm sure your readers will be familiar with is your very own 'Flashback Universe', the rest are a variety of Golden Age Comics. How long have you been developing on the Apple/iPhone platform? I'd been toying with the idea of developing for the Mac for a couple of years but never got past the initial learning curve. Then I got an iPod touch and was absolutely hooked on the possibilities of the device. So all up it's been about a year now. How would you describe your experience selling apps via iTunes? Is there anything you would change? I think that all developers for the iPhone will agree that the application approval process needs improvement. What we need most of all is consistent reviewers. It's very frustrating to submit an application and have it bounced for a feature of graphical item that's been there for months. What features would you like to see Apple add to the iPod/iPhone devices? The software update that's due sometime in the next few months is going to address a lot of items on my wish list. From a development point of view I'm very excited about the in-app purchase option which will open up new markets. The truth is that the developers are still working out everything these devices can do. I'm not as excited about what new features Apple will add as I'm excited about what developers will come up with. The huge user base of the devices and the obvious willingness of users to buy software for them means that even if the devices don't change, there will continue to be exciting developments for years and years to come. Tablet? definitely. Apple clearly has all the components and technologies in place to make the form factor work. I've been predicting a tablet from them for years. I look sillier every year that passes, but it's getting close, my Apple sense is tingling. The real enabler for that device is the operating system software that they've created for iPhone. The hardware for a tablet has been around for a long time, what has been lacking so far has been the software. With the iPhone Apple has shown that a tablet (even a tiny one) can work, and they've patented the heck out of it so that now it almost HAS to be Apple that delivers a successful device. Obviously from the point of view of the comics industry, a popular and cheap tablet has the ability to bring millions of people to the format. As an adult, I've only been reading comics for a couple of years. I just didn't realize how many mature and intelligent stories were available only in that format. More importantly, I hadn't realized how many stories could ONLY be told through comics. A co-worker bought me back into the fold when he brought into work the his 'Strikeforce: Morituri' collection. It took a while for me to get started but once I did I was hooked again. So much fun, so many great stories. What are some of your favorite comics recently? I'v e tried and tried to get into the mainstream Marvel/DC comics but just haven't been able to. Superheroes haven't appealed to me very much. As a huge science fiction fan I've been very impressed by 'Y: The last man' and 'Ministry of Space'. My most enjoyed series is definitely 'Y - The Last Man'. I'm often tempted to pick up the first TPB again but am reserving it for a special occasion. I also thoroughly enjoyed the first issue of 'Ministry of Space' but that's very much to do with the artwork, specifically the design of the ships. Having just bought the volume 3 of the Brave and the Bold Showcase with some AWESOME artwork by the legendary Jim Aparo… of course I have to write a Blog about whom I think was the definitive Batman artist. I know that many will argue against that. To some, the definitive Batman artist is Neal Adams, although others may root for Marshall Rogers, or Tim Sale, or Jim Lee. To me, it is Jim Aparo. I loved his work and his interpretation of the Batman. Ironically enough, for the longest time, I had only a handful of comics with his work in it. Batman was translated in French in Belgium if I am not mistaken, but sometimes it would be available in Quebec. That is how I discovered Jim’s work in the Batman and Robin comic issue #44. It was featuring amongst other tales “Death has the last laugh” which was originally featured in the Brave and the Bold #111. Then the next issue I saw by Jim Aparo was Batman #84 (by then they had dropped the “and Robin” part of the title) with Mr. Miracle in “The Impossible Escape”, which was originally featured in the Brave and the Bold issue #112. Well it is something that sadly often happens when you read foreign translations of American comics. The Batman and Robin comic was an odd mixture of stories from the Batman, Detective Comics, and The Brave and the Bold comic. So thanks to that… for too long those were the only 2 comics I had drawn by Jim Aparo. Heck for the longest time I had no idea who the artist behind such masterpieces was since too often in those comics, the credits were missing. Until I started buying the American version of Batman which was, as fate would have it, Jim Aparo’s first issue. That was a good day. Loved that issue. Then I got more Aparo goodness in “The greatest Batman stories ever told”. Although just one issue is by Aparo… I loved it. Then I got “The greatest Joker stories ever told”. With my luck, it had “Death has the last laugh”, one of the few Jim Aparo stories I already had. Oh well. Then I got “The greatest team-up stories ever told” with another tale by Aparo. Then DC reprinted the “Wrath of the Specter”. Damn that was good. It was hard to believe that these tales were originally done more then 10 years before I read them. Then in the early 2000s, the assistant director on a project I was working on was getting rid of a truckload of comics he had. … and a pile of Brave and the Bold by Jim Aparo. Now that was some great stuff. No longer did I have just a few Jim Aparo comics. Then I managed to find a few Phantom comics he drew. I even got my hands on a rare treat, “The Untold Legend of the Batman”. The first issue is penciled by none other then John Byrne inked by Jim Aparo. The Brave and the Bold Showcases. I would be tempted to say that Volume 3 features Jim Aparo’s best work. But then again I am still missing the work he did in Detective Comics (although I do have one issue) and surely a truckload of other comics. For some reason, I seem to be one of the few Jim Aparo fans. I did not see many who were fans of his work. Sadly to some, he seem to be little more then a lesser copy of Neal Adams, which might be why Jim Aparo does not get his own page in the book “The Great Comic Book Artists” by Ron Goulart. L Or that he barely gets mentioned in “Batman; The Complete History”. I can’t help but feel that his work has been greatly underappreciated. His work has been a great inspiration to me. His use of black, crosshatching and shadows to convey mood and atmosphere to a page is nothing short of breathtaking. And his work is even better in black and white. Hopefully, others will be able to discover his work in the various black and white showcases in the years to come. Here is a small homage to such a great artist. 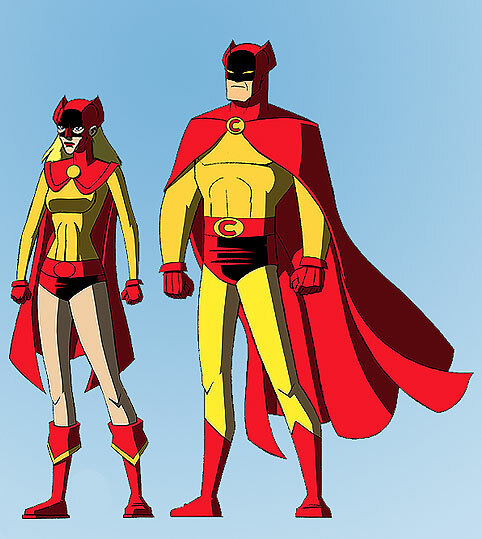 Pierre also created some modern versions of Cat Man with a sort of Jim Aparo feel, but I'll save those for another time. Hope you enjoy these issues! "Know, O Prince, that between the years when the oceans drank Atlantis and the gleaming cities, and the years of the rise of the sons of Aryas, there was an age undreamed of, when shining kingdoms lay spread across the world like blue mantles beneath the stars…Hither came Conan the Cimmerian, black-haired, sullen-eyed, sword in hand, a thief, a reaver, a slayer, with gigantic melancholies and gigantic mirth, to tread the jeweled thrones of the Earth under his sandaled feet." Robert E. Howard’s Conan was the first literary sword and sorcery character to make it into comics, but he wasn’t the first sword and sorcery character. Conan made his debut in the December 1932 issue of Weird Tales in a story titled “The Phoenix on the Sword.” This story takes place late in Conan’s life, when he’s king of Aquilonia. It seems a strange place to begin chronicling the barbarian wanderer’s adventures, given the distinct lack of wandering and the decreased levels of barbarism, but this beginning seems to have come by accident. 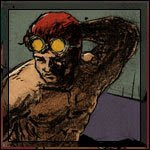 Conan debuted in a story Howard rewrote from a story he had been unable to sell featuring an entirely different character. The original story was “By This Axe I Rule!” and the original hero was Kull. It was Kull, debuting in Weird Tales August 1929 with “The Shadow Kingdom,” who is often considered the first sword and sorcery hero. 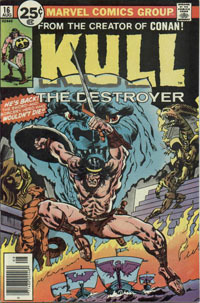 Only two Kull stories were published during Howard’s lifetime, though others have made it into print in collections since. Like Conan, Kull’s a barbarian that winds up winning a kingdom. Unlike Conan, the majority of Kull’s adventures deal with his life after becoming king, and mainly center around how heavy the head is that wears the crown. Kull’s a more philosophical and introspective character than Conan—which may explain why he’s never been as popular. He’s a (relative) latecomer to comics, too. He first appeared in 1971 in Marvel’s Kull the Conqueror, then a succession of two more short lived series of that same title from 1971 to 1985. He also starred in a short-lived, black and white magazine Kull and the Barbarians (which sounds like a gothabilly band, doesn’t it?) in 1975, and made some crossover appearances with Conan in Savage Sword of Conan. After years of quiet repose, King Kull loosed his blade again, this time for Dark Horse, beginning in 2008. You just can’t keep a good barbarian down. 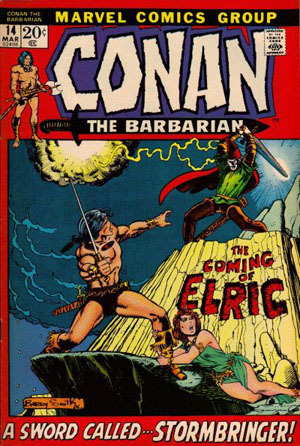 Not only wasn’t Conan the first sword and sorcery character, he almost wasn’t the first to make the leap to comics. Roy Thomas, tasked by Martin Goodman with bringing sword and sorcery to Marvel, had assumed Conan would be too expensive. 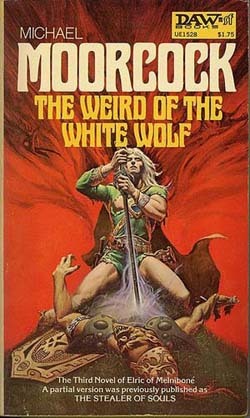 As he relates in his essay in The Chronicles of Conan Volume One (Dark Horse), he had initially pursued the first sword and sorcery character he had gotten into—Lin Carter’s Thongor of Lemuria. The Thongor novels were a canny attempt by serial pasticher Lin Carter to combine two of his passions in one. To wit: Thongor--Northern Barbarian (remember Cimmerians? Like them) who adventured in a pseudo-prehistoric milieu (the Hyborian—uh, Lemurian Age) but one which included city-states, airships, and invented flora and fauna (like Barsoom, or Amtor, or—well, you get the idea). In other words, they were Conan if written by Burroughs, or Howard doing planetary romance (which he actually did once, but that’s another story). Thongor swung his first sword in The Wizard of Lemuria (1965). Roy Thomas and Stan Lee figured the younger, less established Carter would cut a deal for less. And apparently, Stan thought “Thongor” sounded more “comic book”—and he has a point. Such was not to be. Due to the vagaries of negotiation, Conan came through, and Thongor would sit on the sidelines until March 1973 with Creatures on the Loose #23, where he would begin flexing mighty thews and generally behaving in a Conan-esque manner. Ravenhaired Thongor became a red-head after a couple of appearances, perhaps to distance him visually from his barbaric forebearer. Only, presumably, his hair-dresser knows for sure. Thongor battled monsters and foul sorcery until Creatures on the Loose #29 (1974), when he lost the book to Man-Wolf. Several of his appearances were written by George Alec Effinger, whose 1986 cyberpunk novel, When Gravity Fails, won both the Hugo and Nebula awards. Gardner Fox, with a long history of comics work and sword and sorcery (with his barbarian, Kothar) would work on the run as well. 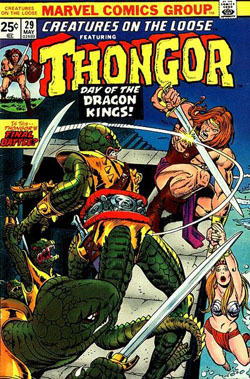 Thongor is obscure today, but he had shining moment of popularity (apparently) in the seventies. Lin Carter relates in Imaginary Worlds, that a Thongor musical was in the offing, though I’m unsure if it was ever actually performed. A Lin Carter website tells of a Thongor movie in production that was reported in Starlog #15, apparently from the same cinematic titans that brought us the Doug McClure (and Caroline Munro!) vehicle The Land that Time Forgot. L. Sprague De Camp, pasticher-in-chief, and his aide—uh—de camp, Lin Carter, had been adapting Howard’s non-Conan yarns into Conan stories to feed the maw of the Lancer Conan paperback series. Thomas had copied that approach in the comics, but expanded it to the adaptation of even non-Howard stories into Conan stories. In March 1972, he’d port over another character into Conan’s world—aided and abetted by that character’s creator. The two-part story beginning in Conan #14 (“A Sword Called Stormbringer!”) adapted the original thin, white duke, Elric of Melnibone, in the Mighty Marvel Manner. Conan and Elric team up against Xiombarg, the Queen of Chaos, burrowed from the chronicles of Corum, another of Moorcock’s fantasy series. Elric, albino prince and sort of anti-Conan armed with the don’t-call-it-a-phallic-symbol sword Stormbringer, is the creation of Michael Moorcock, and first appeared in literary form in the 1961 novella, “The Dreaming City.” His story continues to this day, the most recent novel having been published in 2005. This Marvel Team-Up-esque two-parter wasn’t Elric’s only foray into comics. French artist Philippe Druillet of Metal Hurlant fame, produced an unauthorized Elric graphic novel in the late sixties. Later, the “Dreaming City” was adapted as a Marvel (Epic) graphic novel by P. Craig Russell and Roy Thomas. Since the end of the Bronze Age, Elric has periodically raised his runesword in comics from First, Dark Horse, and DC. One of the writers who provide more Conan comics material was John Jakes. Before he became forever linked with Patrick Swayze (at least in my mind) by the TV movie adaptation of his 80’s best-seller historical saga, Jakes wrote some Conan-inspired tales of sword-swinging adventure. His barbarian hero was blonde with a braided ponytail, named Brak. Brak first appeared in “Devils in the Walls” in the May 1963 issue of Fantastic. He went on to star in a series of novels beginning in 1968 with Brak the Barbarian. In 1982, Jakes’ second successful historical fiction series, North and South began, and Brak has been seen no more. Jakes first foray into comics was without his creation. He wrote the plot that became Conan the Barbarian #13, “Web of the Spider-God” (January 1972). Exactly a year later, Brak debuted in the second issue of the horror anthology Chamber of Chills. This story was reprinted in the black and white Savage Tales (vol. 1) #4 (July, 1974), whose cover promised “THE MOST SAVAGE HEROES OF ALL.” Brak went on to do battle with the minions of evil, god-thing Yob-Haggoth, in his quest to reach Khurdisan the Golden and the high life, for just two more stories in Savage Tales (issues 7 and 8) before disappearing into the mists of Bronze Age legendry. Brak never even got a cover appearance, most of those having been hogged by Ka-Zar. Perhaps it was because DC didn’t have the works of Robert E. Howard to fall back on, or maybe it was a reluctance to delve into this sort of material, but for whatever reason, they didn’t adapt as many literary sword and sorcery characters as Marvel. When they did, at least they got two for the price of one—Fritz Leiber’s sword and sorcery duo, Fafhrd and Gray Mouser. Fafhrd and Gray Mouser’s prose debut was in Unknown magazine in “the Year of the Behemoth, the Month of the Hedgehog, the Day of the Toad”—well, in story, at least. In our world we may reckon that as August 1939. Leiber chronicled the twain’s adventures off and on from that story until 1988’s “The Mouser Goes Below”—a longer span than the entire life of Robert E. Howard. Fafhrd was a Northern barbarian from Cold Corner, and Gray Mouser was a thief and one-time sorcerer’s apprentice from the urban South. They met in decadent Lankhmar, “City of the Seven Score Thousand Smokes,” and became lifelong friends and companions in (mis)adventure. The issue was written by New Wave science fiction luminary, Samuel Delany. Highlights include Fafhrd backhanding Diana, and Mouser and Catwoman having a totem-appropriate face-off, before they all decide to join forces. This all serves as a “backdoor pilot” for the twain’s run in the bimonthly Sword of Sorcery seriespremiering in 1973. It only ran for five issues, but featured original stories and adaptations, most scripted by Denny O’Neil (except for one by George Alec Effinger), and featuring art by Howard Chaykin, Walter Simonson, and Jim Starlin. 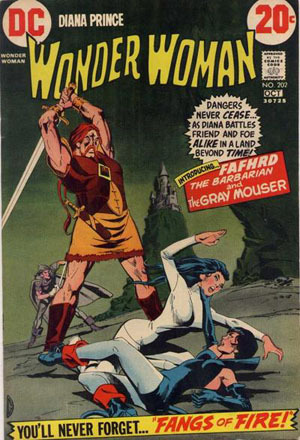 Fafhrd and Gray Mouser vanished from DC at the cancellation of Sword of Sorcery. The two were next sighted at a different company in the 1991 Epic limited series which reunited them with Howard Chaykin, who scripted adaptations of Leiber’s tales. All issues featured evocative art by Mike Mignola. “Let teachers and priests and philosophers brood over questions of reality and illusion. I know this: if life is illusion, then I am no less an illusion and being thus, the illusion is real to me. I live, I burn with life, I love, I slay, and am content." Sword and Sorcery comics did good business in the Bronze Age, both with the licensed characters above, and original creations like Arak, Wulf, Claw, Ironjaw, and the Warlord. It was a true Golden Age for comic book sword-swinging! 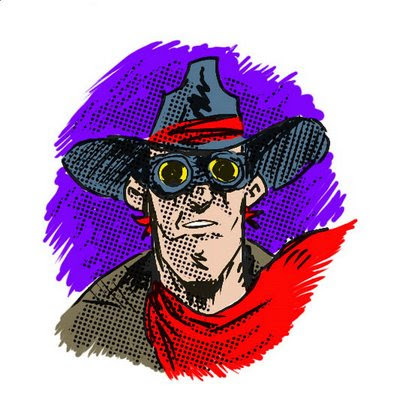 Today, Robert E. Howard properties are still appearing in comics, mostly from Dark Horse. Image has given us a line inspired by some of Frank Frazetta’s great sword and sorcery-inspired paintings. Marvel and DC, on the other hand, have concentrated on the mainstream superheroes that are their bread and butter; most of their sword and sorcery creations stalk only the back issue bins. These things go in cycles, surely. Maybe one of these days will see Karl Edward Wagner’s Kane, or perhaps the outré exploits of Michael Shea’s Nifft the Lean., realized on the comics page. According to Roy Thomas, Gray Morrow had completed an adaptation of the Conan story "The Elephant Tower" for Timely, but the story was never published. As far as Roy knew, the original art had been destroyed. I don't know the exact dates for this, but it was some time in the 1950s. Then, in the late 60s, Gil Kane got the rights to make Conan comics, and he was going to self-publish these in magazine format following His Name Is ... Savage in 1968. Savage, however, was a financial failure for many reasons, and Kane had to give up the enterprise. He did work with Roy to convince Stan Lee to pick of the license, though. But when it came time for Stan to assign the artist on the series, he picked John Buscema instead, because he felt that Kane was too valuable an artist to waste on a series that was probably going to fail. My goal has always been to make comics. I have been wanting to do that even since I was a kid reading the Incredible Hulk awesomely drawn by Sal Buscema. Or Spider-man by Ross Andru. Or the Avengers by George Perez. Or the X-Men by Dave Cockrum. The very first submission was a comic I had made around 1985. It was a short 4 or 5 page story. I never heard from the editor, and sadly I was too much of a fool to realize that I should have made a copy of my work before submitting it. Although I later got a few pin-up published a little later. I had made it to stardom. ;) I was the “star” of my neighborhood for a while thanks to getting 3 pin-ups published. Then I figured… no more monkey business. Time to get serious and I came up with some sample pages to submit to Marvel Comics no less. Ahhh… the foolishness of youth. I had NO CLUE as to what I was doing. I was still drawing on 8.5 X 11 paper with the 3 holes on the side. Damn how I ignorant I was. I had just bought the “Best of Marvel Comics” volume one(Awesome book), and was blown away by the Thor story “The wrath of the Wrecker”. So I HAD to try to capture the magic of that tale by including the Wrecker in my submission. So I came up with a bunch of pages with Spider-man and the Wrecker. Sadly, that became my first rejection letter. But it did teach me a thing or two from the various comments in the letter. Then I submitted to DC, but I did not know many DC villains, so I used the best one….Darkseid. This was after Crisis. So since there no longer was a Superboy, I foolishly decided to come up with a “new” Superboy. Of course…. Once again it was rejected. I was a fool and all I could think of was to submit to Marvel and DC. I should have submitted more to small publishers or even to fanzines to try to get at least some experience/published pages under my belt. But I was a fool and what I really wanted was to work at Marvel. Heck even DC did not appeal to me much at the time. Although thanks to Crisis and John Byrne’s work on Superman, I was slowly changing my mind about DC. But again, back then I was a fool. What I failed to realize back then was that, before working for Marvel, George Perez, John Byrne, and others I fail to mention were published in fanzines and other such publications. Although now that DC, and Marvel as well, no longer take blind submissions, maybe now many will not be as foolish as I once was. Maybe many will submit their work to smaller publishers now. The other item is this Yugoslavian dollar bill with a Mister Crimson looking guy on it. I also feel the age of disappearing paper comics is already upon us with many comic publishers going under and DC's comic sales at it's lowest point in 6 years. And while it's exciting to predict such change, it's not necessarily fun to watch the agony. So, I'd like to change the direction of this column a bit, focusing no longer on the doom descending on the paper comics industry but rather concentrating on Digital Comic news and technology. As MARVEL and DC strugle to reach their full potential, no doubt shaping and reshaping, what may become known as the DIGITAL DELIVERY Age of Comic Books there are many less well known publishers out there already using digital distribution methods. Today we are going to highlight a few comics from these other companies - comics we predict will be SHINING STARS of the DIGITAL AGE of Comic Books. Note: If you would like to have your comic featured in a future article, please send us a link to your comic. Carson Deeds is a 17-year-old, emotionally troubled time bomb with a loaded shotgun underneath his bed and a list of classmates firmly in his aim. When a mysterious suit of armor falls into Carson's unstable hands, he finds himself wielding the power to live out every revenge fantasy he's ever dreamt against a world that he feels has done him wrong. Crime and despair. Violence and fear. The city is under siege. Years ago it had a protector, the Venger, who brought his justice to those who brought evil. Now he is old and memories of him have faded from the minds of the people. But the enemy and his brand of evil have returned and no one else understands. He will be needing help this time. A new Venger will take up the fight. But how far will he go to destroy the enemy. And will he destroy his family in the process? War! Mankind is at the very brink of extintion as mindless Event Freaks, powerful humans infected by alien superparticles, destroy everything in their wake. And as the flames threaten to engulf the globe, hope is reborn anew in the tiny coastal village of Cape Ruseur, New England, where four childhood friends unite to turn the tide of destruction and fight for life and justice. Infiniteens is a superhero saga about the end of the world. It's a touching tale about human hearts and how the best in us can emerge in our darkest hour. For 8 chapters you´re invited to join Nadia, Luther, Julian and Beverly in a heroic struggle to save their tiny community from an apocalyptic threat. In the year 2086 humanity faces a new threat, Extra Humans. The government is struggling to cope with the growing number of mutants, aliens and supernatural beings who are living amongst us. People are beginning to panic and so, in 2050, the Department for Extra Human Affairs was established with a remit to try and contain the problem. By 2086 the situation has escalated, so they have formed a new rapid response strike force, the Alpha Gods. Who better to police the Extra Human community than Extra Humans themselves? Werewolves (and a whole lot more) in the Old West. A grumbly, bounty-hunter, Matthew Macgregor, investigates a series of strange happenings in the dusty Texas town of Blest - where drought has brought famine and hardship to most of the town and surrounding ranches. Unfortunately, that's the least of the town's worries! While the summer heat pushes the mercury toward further unbearable degrees during the day, the nights are haunted by strange, unnatural creatures roaming the darkness. While Macgregor, a former Pinkerton agent, seeks to uncover the towns dark secrets, he tries desperately to keep his own hidden - secrets of a past steeped in witchcraft and the supernatural. When the sun sets it'll be a showdown at High Moon. From the horrors of Blest, Texas to the mountainous mysteries of Ragged Rock, Oklahoma, werewolf-hunter Macgregor investigates a series of murders following a bizarre train robbery. But, do his true motivations belie a sinister past? Soon, the town murders become the least of his worries as he finds himself caught in a vendetta, forced to do battle with a technological monstrosity. As he confronts his own dark origins, Macgregor must make the ultimate decision: live like a beast, or die like a man? Go check out some of these great comics today!